Enjoy the complete coverage of this incredible display of skill and strength. You will see the world’s greatest Strongmen in action as they pit their skills against each other in these unique challenges of strength, power, stamina and determination. 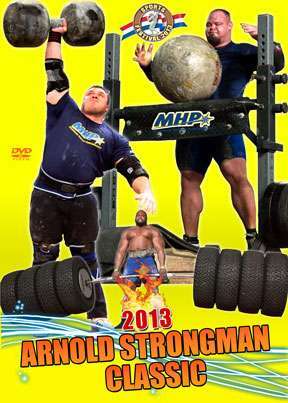 The Arnold Strongman Classic was part of the 2013 Arnold Sports Festival and the 25th Anniversary Arnold Classic. The first 4 events took place on Friday, March 1st at the Fitness Expo at the Greater Columbus Convention Center. The final event was staged at the Arnold Classic Finals on Saturday night at the Veterans Memorial Auditorium, Columbus, Ohio. Enjoy the complete coverage of this incredible display of skill and strength from Days 1 and 2. This DVD covers every moment of each of the 5 events. You will see the world’s greatest Strongmen in action as they pit their skills against each other in these unique challenges of strength, power, stamina and determination. The events are designed to test brute strength and determine which competitor is the strongest man! New world records were set, and the exciting final event, the Circus Dumbbell Lift, was held on the Veterans stage in front of thousands of fans. The first time winner, VYTAUTAS LALAS of Lithuania was presented his award by Arnold Schwarzenegger. The video includes the COMPLETE ACTION from all four events: AUSTRIAN OAK – SMALL LOG, MANHOOD STONE, TIRE DEADLIFT and CIRCUS DUMBBELL LIFT. ARNOLD STRONGMAN CLASSIC PHOTO GALLERY. Thanks to Jason Breeze for the great photos. The events held at the Expo stage were shot with standard definition cameras and include the sponsors logos across the bottom of the screen. The final event, the Circus DB Lift, was shot with HD cameras at the Veterans Memorial stage. Contestants lift round stones weighing up to approximately 550 lbs pounds. All men try to lift the stone over a bar no higher than 125 cm or 49″ (same for both stones), as often as possible in 60 seconds. The Stones weighed 454 lbs (206 kilos) and 540 lbs (245 kilos). From the Floor to Arms’ Length Overhead, two different logs are used. The “Small” log weighs between 374 pounds (170 kg) and 385 pounds (175 kg). The “Large” log weighs between 441 pounds (200 kg) and 452 pounds. The challenge to the athletes is to take the log from the platform and lift it to arms’ length overhead for as many repetitions as possible in 90 seconds. This is a brute strength left for Maximum Weight. The tires on a new Hummer weigh approximately 100 pounds (45 kg) each, and the lightest weight available in this event was a little over 600 pounds (270 kg). By adding barbell plates and additional tires, the weight of the bar was increased in increments of between ten and twenty pounds (five and ten kg) so that the competitors can take whatever they want as the weight on the bar goes up. Each man will have three attempts, and we will use the “round” system, in which the lightest first attempt will be done first, followed by the next heaviest, and so on. This year this brute of a dumbbell weighed 264 Pounds! Competitors will have 1.5 minutes (90 seconds) from the time their name is announced and the whistle has blown to lift the Bell from the floor to overhead, as many repetitions as possible. The dumbbell has a very big handle 3 inches in diameter. The men may only use one hand at a time to actually lift the dumbbell overhead, as many times as possible in 90 sec. As this was a new heavier DB, the winning total of 5 repetitions was a new WR in this lift, set by Vytautas Lalas.